Happy Father’s Day! Special complimentary breakfast for Dad! Hurray, it’s Summer! Have a great day with family and friends! Thanks for being part of our Hidden Acres Family! Adult Bingo, a non-smoking event, is held most Friday’s, beginning June 28 until August 23, at 8:00pm in the Rec. Hall. 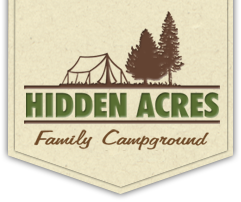 No fireworks are allowed at Hidden Acres Family Campground. Thank you for your co-operation. Peggy’s Gathering Place will open May 17th. You may register for events anytime beginning May 1st. Thank you!